The Travelling Rubeshes: Kyler's One! Kyler's officially a number old - he turned ONE yesterday. 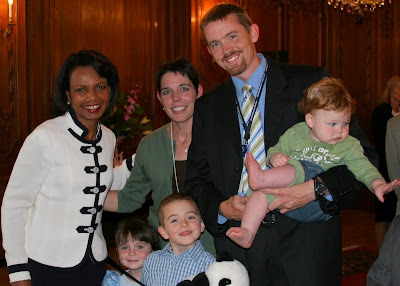 To help celebrate the event, we had a very special guest - Secretary of State Condoleezza Rice stopped by in Prague - just to help celebrate! 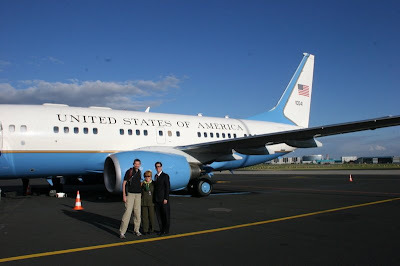 She had to break away from the party a bit early to meet some Czech parliamentarians, sign a treaty, attend a state dinner, and run some other errands while she was in town. Dr. Rice did stop long enough to comment on Danna's Cinderella dress, meet Jad's friend "Panda", and wish Kyler a very happy birthday! Kyler, of course was much more interested in grabbing the hair of the kid standing next to him. The second most exiting event of the day? The chocolate cake, of course! We have a tradition in our family - turn one, and you get to plant your face in a chocolate cake - stuffing it in your mouth whichever way works best. Kyler had no problems fulfilling his role as a our latest one-year-old-cake-eater! A job well done, I'd say... only thing left for me was to help the special guest hop back on her plane this morning. Oh, my goodness, that is the most fantastic picture ever! I love it. Happy birthday, Kyler! Happy Birthday, Kyler!! I can't believe you are one already!! Great pics! WOW.. Kevin, you must be pretty important!! I might need to get your autograph next time you are in OR! :) How exciting and educational for the kids to meet her, too! Hope you all are well!! Any trip back "home" this summer?